What are the best options for towel storage? Let’s take a moment to think for a second about bathroom towel storage – then we’ll move on to some dos and don’ts. Imagine you're about to take a shower and your towel is in the laundry so it’s time to get a fresh one (I love a fresh towel). Maybe you take a fresh one from the bathroom towel storage spot, or maybe there are towels stored in your hot press (airing cupboard). So towel in hand, locking the bathroom door you feel a chill in the air and put your towel on the towel warmer, or it goes on a hook or towel bar ready to welcome you into its fabric embrace once you’ve finished your shower or bath. Feeling suitably refreshed and relaxed you towel off so now you’re looking for a place to put your towel so it will dry ready for next time. 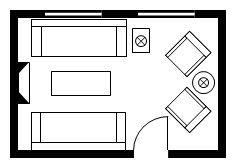 What are the three scenarios for bathroom towel storage? Here goes with the dos and don’ts of bathroom towel storage – there are more dos than don’ts – accentuate the positive and all that! Do – keep towels in the hot press (airing cupboard) if they’re going to be stored for longer than a few days. Even if you need to get one out quickly it won’t be ice cold to the touch. Don’t – keep all your towels in the bathroom. The air in the bathroom is damp and it’s not the best place to keep towels long term. A few towels in the bathroom ready to be used are fine provided that they won’t be there for too long before they’re used. Do – fold or roll them nicely, wherever they’re kept – it just looks nicer. Don’t – store your towels where they’re likely to get splashed. 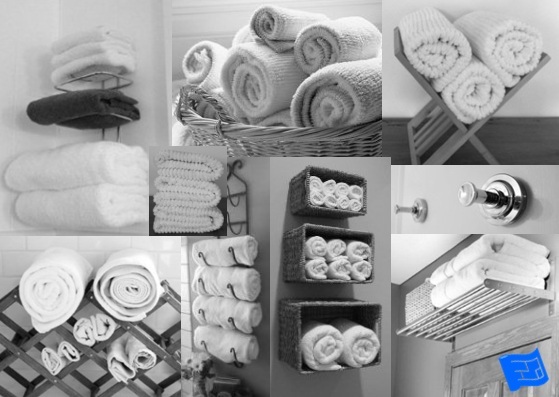 Do - find a nice looking and practical solution for your bathroom towel storage. Try Folding or rolling and placed in a basket, on shelves, on a shelf above a door, in a cabinet, in a music rack, on a wine rack or on a hotel style towel rack. Do - have a hook, towel bar, towel ring, towel rack or towel warmer near the bath and shower so that you can grab the towel and use it to dry off in or near to the bath or shower without dripping water all over the kitchen. I don’t like towel rings for big bathroom towels – don’t get me wrong – they look nice but there are two things that bother me about them. First is getting the towel in and out of the ring. It’s a bit of a wrestling match and I find the ring bangs against the wall – it seems a really small detail but first thing in the morning when I’m still half asleep or if I’m trying to get into a relaxed mood the sound of metal banging on tile is not welcome! Do – make sure there are hooks and racks / bars placed at appropriate heights for any children in the home. You might stand a small chance of them hanging their towel up rather than leaving it on the floor. Do – install a towel warmer in your bathroom if you have room and you would appreciate a warm towel. There are wall mounted, floor mounted and now new drop in towel warmers. Note that you shouldn't necessarily rely on your towel warmer to dry your towels. Do – install a towel rack, or towel bar that is wide enough to hang your towels without having to fold them over more than once to fit them on the bar. 30" should hold a small bath towel with no folding or a large bath sheet folded only once. 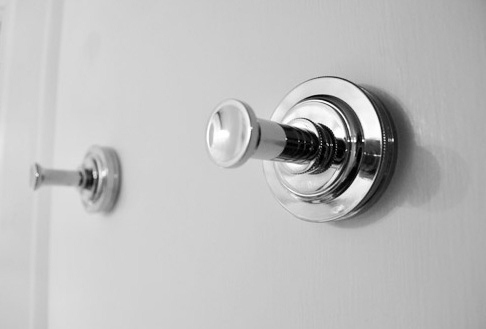 Your bathroom towel fixtures might be floor standing, wall mounted or mounted on the back of the door. In fact - mounting two towel bars, one above head height and one at waist height, on a wall or on the back of a door means that several towels can be dried at once. Do – have an idea of what size bath towel you’re going to be using before you buy your towel rack, towel bar or decide what height your towel hook should be. Don’t – use hooks or towel rings to dry your towels – your towels are not likely to dry out fully and no one likes a damp towel. Do – consider having your family store their towels for drying in their bedroom. A drying towel takes up quite a bit of hanging space. A towel bar on the back of each bedroom door might be a better design solution than 4 towel bars in the bathroom. Do – think about using the shower curtain bar to hang your towel to dry. As long as the curtain bar is strong enough you’ll be able to hang even the biggest towel straight over bar without folding it and it will dry in no time. 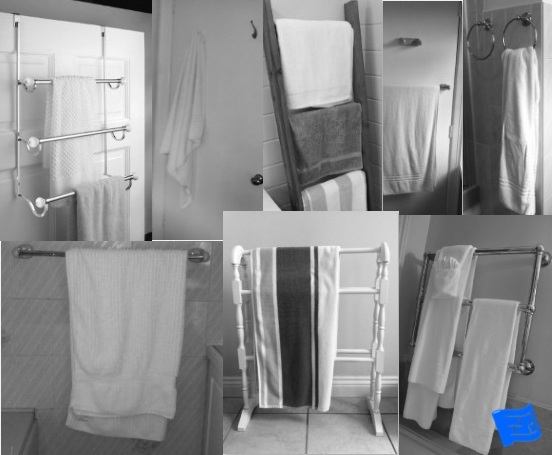 Don’t – depend on your towel warmer to dry your towels – unless the design of the towel rack is wide and means the towel can be hung without folding it over too many times. Don’t – forget that your bath mat needs a spot to hang to dry as well.